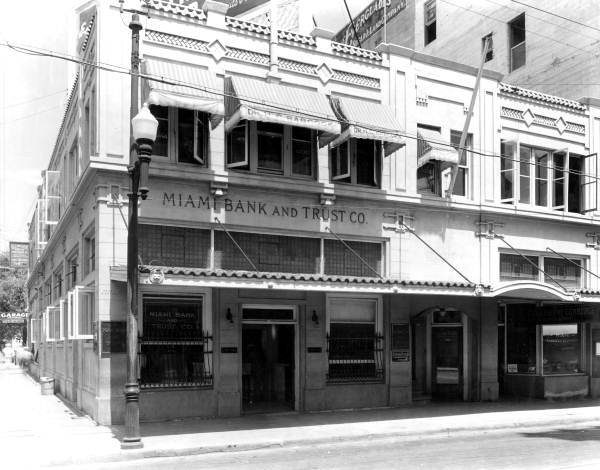 Miami Bank & Trust Building in 1925. Photo found in Historic Designation Document. Downtown Miami’s Langford Building (circa 1926) has been renovated and will officially re-open as the Langford Hotel the week of March 28th, 2016. The opening of the hotel will mark a new chapter for a building that has been part of the Miami skyline for 90 years. While the building’s exact opening date in 1926 is uncertain, researching Miami Herald advertisements indicate it was probably in April of that year. 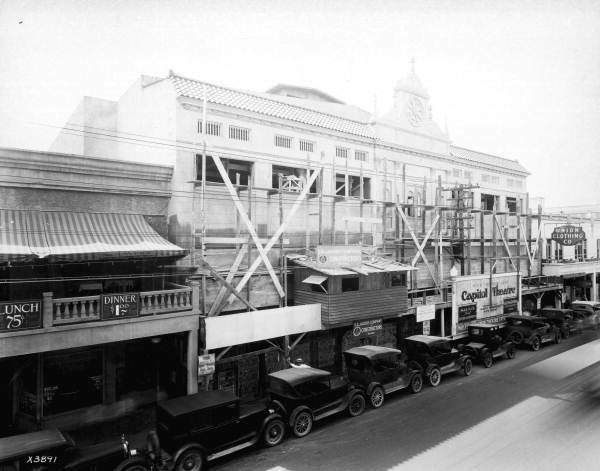 The building’s construction began in 1925, which was the peak of the building boom of the 1920s. 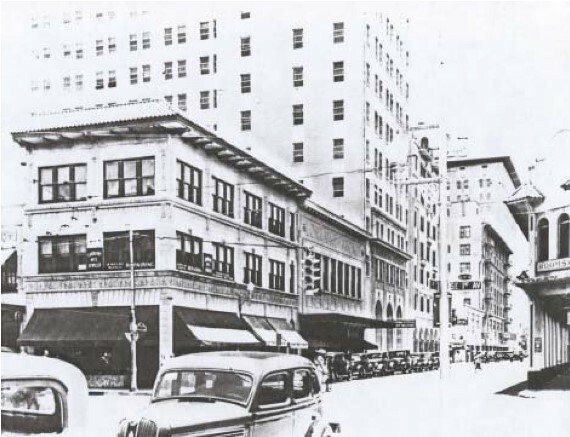 The Langford proudly served as home to several early banks, a prominent insurance company and many other commercial entities that operated out of downtown Miami. While its resiliency and adaptability have been impressive, the Langford Building’s early years represented constant change. Tracing the formation and merger of several banks help clarify the changes endured by the building. The predecessor to the bank that built the Langford Building was the Fidelity Bank and Trust. It was organized and launched by LT Highleyman, who was a prominent early Miami businessman. The bank’s officers included other prominent men of early Miami, including a future Mayor of Miami, EG Sewell. The bank was started in December of 1915. Highleyman is probably best known for his contributions as an early developer of prime real estate. He was responsible for platting and developing a prestigious neighborhood along Brickell Avenue called Point View. Point View was located on the east side of Brickell Avenue between 14th street and 15th streets which included today’s Brickell Bay Drive. The street was referred to as Bay Shore Drive when the Point View subdivision was developed. Highleyman, and one of his appointed vice presidents at Fidelity Bank and Trust, Clarence Busch, were partners in the development of Star and Palm Islands. It was Clarence Busch that unknowingly sold Al Capone his home on Palm Island. While Highleyman was very successful in real estate, he wasn’t so lucky with Fidelity Bank and Trust. He resigned as president in April of 1921, but remained as chairman of the board. However, the bank would stay open one more month following the change in leadership. Fidelity Bank and Trust closed for good on May 19th, 1921. Within months after Fidelity Bank and Trust closed its doors, JR Anthony and associates formed a new bank called Miami National Bank. The bank was formed on September 6th, 1921 and opened their offices at 116 East Flagler Street. Anthony would appoint George B. Nolan as president of the bank. The bank assumed the assets of Fidelity Bank and Trust. Originally from Marietta, Georgia, George Nolan relocated from Orlando to Miami to run the newly formed bank. Within a few years of moving to Miami, George would move his family into a beautiful home at 1548 Brickell Avenue. The eight bedroom, five and a half bath home was built for $28,000 in 1925. It still stands at the same location and was given historic designation on June 17th, 1997. Within two years of formation, the Miami National Bank merged with Miami Bank and Trust Company. The merger was finalized on February 12th, 1923. The bank would operate as Miami Bank and Trust Company after finalization of the merger. Miami Bank and Trust continued to operate out of 116 East Flagler Street but would plan to build their own signature building. Their new building would be strategically located on South East First Street between SE 1st and SE 2nd Avenues. The newly merged bank hired the architectural firm of Hampton and Ehmann to design their new headquarters. Building activity was beginning to peak in Miami in the mid-1920s and the architectural firms had plenty of work. Martin Luther Hampton and EA Ehmann designed a number of buildings in downtown Miami during the construction boom of this time period. In addition to the Langford Building, there were many other buildings designed by Hampton. The list includes Château Petit Douy at 1500 Brickell Avenue, the Congress and the Meyer-Kiser buildings in downtown Miami, and the Glenn Curtiss Mansion in Miami Springs, just to name a few. Most of Hampton and Ehmann’s work featured a “Spanish style” of design. Two common architectural styles of the era were Mediterranean Revival and Masonry Vernacular. Hampton and Ehmann had experience designing buildings in both styles and were comfortable adapting elements of each into the Miami Bank and Trust building. The historic designation report indicated that the Miami Bank and Trust building consisted of a variety of architectural elements that the “architectural firm was capable of handling”. The building’s exterior appearance contains elements of Neo-Classical mode and consists of characteristics from mid-twentieth century commercial design in Miami. The classically designed decorative ornamentation and the open loggia are two examples of the style of this era. The arcade was necessary to provide shade along the walkways, which was rather important given the summer climate in Miami. The eleven story building began construction in 1925. Given the challenges of acquiring enough building materials and labor to finish the construction during the height of the building boom, it was quite impressive that the building was ready by the spring of 1926. There were a couple of ads that appeared in the Miami Herald during the spring of 1926 that indicated tenants were moving into the building around mid-April. Bert Chaplain, a real estate operator who formerly had offices in the First National Bank building, announced that he would be open for business at 121 SE First Street by April 14th, 1926. Another ad in the Miami Herald announced that WC Bliss, Civil Engineer, would be open for business on April 15th, 1926 in the new Miami Bank and Trust building. The boxes had hardly been unpacked at the bank’s brand new headquarters when more change occurred. The 1910s and 20s represented a very fast pace for the banking industry in Miami. Less than two months after the move into their new headquarters, the Miami Bank and Trust Company was acquired by City National Bank and Trust. One of the principal shareholders of City National Bank and Trust was JC Penney. Penney’s initials stood for James Cash. If your middle name is “Cash”, you may as well be in the banking business. Funding real estate projects in Miami also created a big boom for the banks that financed the projects. As fate would have it, the boom was really just a rapidly expanding bubble that would eventually burst. The sale was completed on June 6th, 1926. The name on the outside of the building was updated to reflect the change in ownership. On August 14th, 1931, Florida National Bank entered the Miami market by purchasing City National Bank and Trust. Florida National had branches in Jacksonville and other locations north of Miami. Florida National Bank was part of the Alfred I Dupont conglomerate of businesses. Florida National took over the City National headquarters at 121 SE First Street and remained there until the late 1930s. They moved to the Alfred I Dupont Building in roughly 1937. The building at 121 SE First Street continued to be occupied by different commercial entities, but was now without a flagship tenant. That wouldn’t change until George W. Langford purchased the building in the early to mid-1940s. George Langford was a financier and real estate developer. By the time he purchased the City National Bank and Trust building, he had already developed the Ponce de Leon Hotel on Flagler Street, the McAllister Hotel on Biscayne Boulevard and the Fleetwood Hotel on Miami Beach. An advertisement in the Miami Herald on March 25th, 1925, announced that Langford was beginning another project on 27th Avenue for a residential development called McAllister Terrace. Langford was an established builder and property manager. Prior to his purchase of 121 SE First Street, Langford’s office was located in the McAllister Hotel. However, after purchasing the building on First Street, he renamed it to the “Langford Building” and moved his operations into his new investment. The Langford Building would continue to rent space to a variety of businesses. By 1949, George Langford had a new flagship tenant. The city directory listed Langford and Ledbetter Inc. as the main tenant in the building. The company was a commercial insurance firm that specialized in underwriting construction projects. Langford and Ledbetter would continue to be listed as the main tenant until the listing changed in the 1958 city directory. It is not clear if the business folded or moved, but the firm would no longer be listed at the Langford Building in future city directories. Despite a changing landscape in downtown Miami, the Langford Building continued to operate as commercial office space. While some of the older buildings in downtown Miami were becoming abandoned and neglected, there was a push in the late 1980s to preserve the building at 121 SE First Street. On November 17th, 1988, the Langford Building was officially placed on the City of Miami’s historic designation list. It was registered as the City National Bank Building. However, the building continued to be referred to as the Langford Building. It wasn’t until 2012 until a new owner envisioned a different use for the building. Stambul USA purchased the Langford Building to retrofit the commercial space into a boutique hotel. By the turn of the century, many South Florida residents were beginning to gravitate back into the urban core of Miami. Condominiums, hotels and retail establishments began to see a steady increase in the number of residents and tourists enjoying the downtown area. While the new owners had hoped to open in December of 2013, it will be officially opening soon. There was a ribbon cutting ceremony last week and the hotel management group expects the hotel and restaurants to be open prior to the end of this week (March 28th, 2016). The boutique hotel will continue to carry the name that has been on the building for the last seventy-plus years. The Langford Hotel begins a new chapter for the grand old building. Given the restoration effort and investment, it is well-positioned to continue to be a fixture in the Miami skyline for many more years. 8 Comments on "History of the Langford Building"
Great piece! Other tenants seem to have included offices for WAVES during World War II and the 26th of July Association in 1957; the latter was partly responsible for putting Fidel Castro in power in Cuba. Great info, Sylvia. Thank you!! What a great article about this grand old building. I didn’t realize that George Nolan was associated with one of its predessor banks early on. Some 30+ years ago, I had the pleasure to meet his daughter, Henrietta Harris who still lived in the mansion on Brickell, through a mutual friend. At the time I worked for the late Citizens Federal Savings and Loan Assn. Which was just up the block from her home at 999 Brickell. The next time I saw our mutual friend, an antiques dealer, her said: “Mrs. Harris came by and dropped this off for you. She said it belonged to her father who was a banker like you!” It was George Nolan’s business card case from Orlando before they’d moved to Miami, and a conventioneer badge from the 1917 Fla. Banker’s Assn. in St. Augustine. I treasure them to this day and would be happy to share photos of them if you email me…..
Hi, Bob. I would love to see images of the items that you have from George Nolan and his family. You can reach me at casey@sfwebnet.com. I look forward to hearing from you! Great article! Can we also see images? Thank you! There are images included in the article as part of a scrolling light box. If you are reading the article on your phone, and it is not a smart phone, the image light box may not appear. Try viewing the article from a web browser on a computer, tablet or smartphone.